Springtime is in full swing and summertime is just around the corner. I just got an email that my CSA will be starting next week! I can't even express how excited I am for farm fresh delicious vegetables. Paul and I have been wanting salad upon salad lately ... okay, so that's not entirely true. He eats a salad every day for lunch and two or three times a week (for the past two weeks) I have wanted one for dinner! Since he eats salads every day, when we have one for dinner, I feel that I need to make a super special salad for dinner. He always has cold salads and I love to have mix the hot and the cold in mine. I love making roasted chickpea salads because it is so wide open. Sometimes I saute more of the vegetables and sometimes I want everything raw (expect for the chickpeas of course!). The dressing is so thick you could almost use it as a dip ... which you should do with any leftovers ... and you should! The best salads to me are always super chopped up salads that have the dressing all over them. That way, you get a little bit of everything in every bite. There is nothing worse than eating a great salad and some bites are way too oily and other bites are just greens with no dressing. 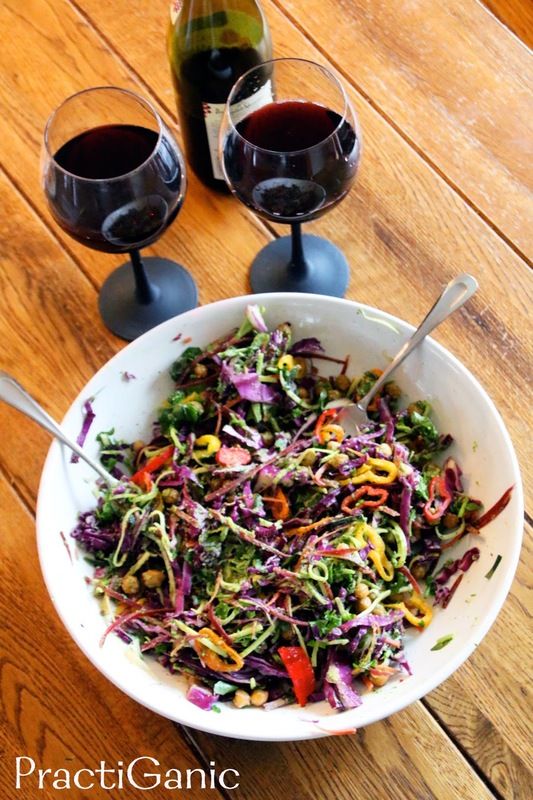 Chop everything small and dress your salad before serving. You won't regret it! This salad can be a side dish, but I love it as my full meal. You will walk away completely full, satisfied and full of energy! Depending on how many people you are making this for you will want to change the amounts of the salad toppings. It was just Paul and I, but I made extra for his next lunch. This makes great leftovers .,.. even if you already have dressed the salad! IF you are making it for more than four people, you may want to double the chickpeas. Preheat your oven for 350º. 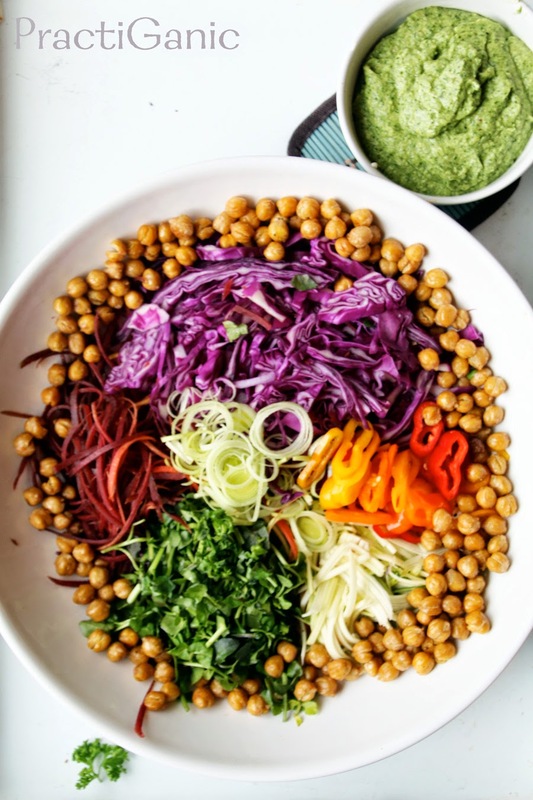 Mix all the roasted chickpea ingredients in a bowl. Lay them out on a sheet tray and back for 35-45 minutes. Take them out and roll them around on the pan every 10 minutes to get all sides cooked evenly. I like mine extra crispy, but some people like them still a little chewy so taste one after 35 minutes to see if they are done to your liking. If not, keep cooking! Meanwhile, chop all of your salad ingredients and throw them in a bowl. 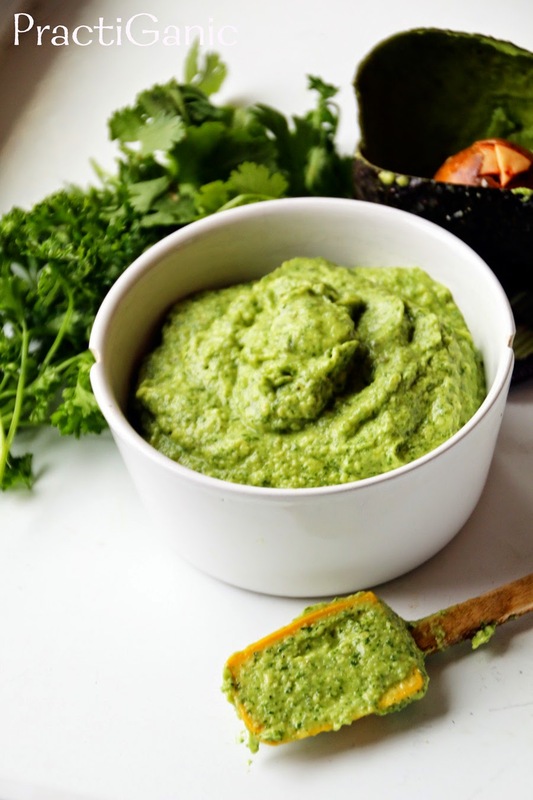 Make your avocado herb dressing too. Put all ingredients in a bowl and use your immersion blender to mix them. It is a thick dressing so if you want more of a dressing like consistency, add more olive oil until it is to your liking. **If you like more cooked veggies and less raw, saute your onion, zucchini and red pepper for about 5 minutes before adding to your salad. Mis your veggies and salad dressing together. Start with about 1/2 cup and add more as you need it (depending on how big your salad is you should have some leftover). Top with your roasted chickpeas.